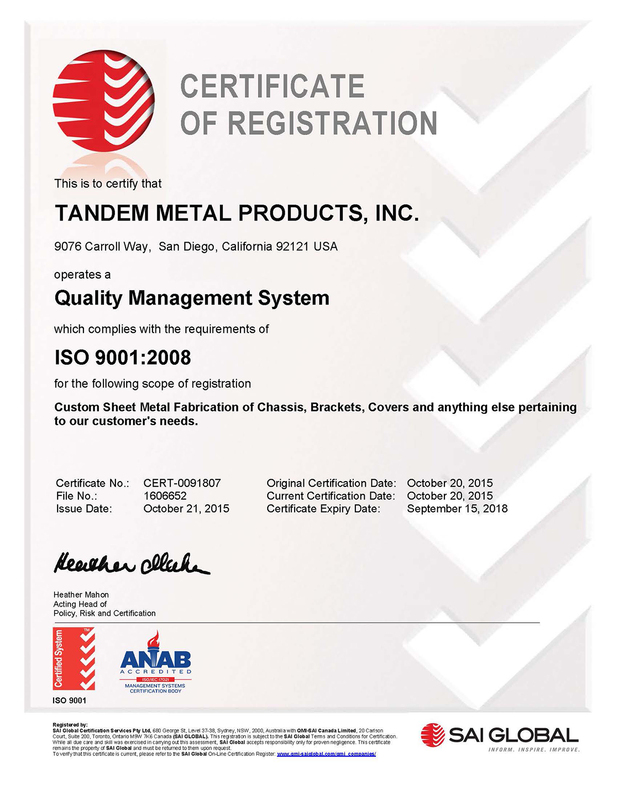 Customers of Tandem Metal Products return to us for sheet metal fabrication time and again, even from outside our service area. This is due to the fact we have built a solid reputation for consistent quality work over the years. We are a family owned and operated business as well as a team with rapid decision making and great results. Quality and precision, our hallmarks, are major reasons we handle such a large volume of OEM products for many manufacturers. Our mid sized firm employs a staff with strong skills and significant experience. We have very low turnover and high employee satisfaction. Both ensure that our customers benefit from strong continuity and working relationships that our clients consider highly satisfying. Our ongoing cross-training sets us apart as well. It allows us flexibility to devote multiple members of our group to your priority projects. You can rely on working directly with our principals, who have more than 30 years of experience. This translates to efficiency and cost savings to you. Contact Tandem Metal Products today and let us handle your sheet metal fabrication needs!